The full-sized Fords bowed for Centennial Year riding on the same shell first seen in 1965. Division officials announced that for the third year in a row, its biggest blue oval models had undergone “major styling changes.” Designers had gone all out to execute a highly tasteful rework of the sheet metal in a necessary bid to halt the annual decline in sales of the full-sized Fords. Rear quarters were nicely broadened and wheel wells made more elliptical than previously. The grille was given a horizontal, two-tiered treatment. Rooflines were more sweeping than ever. Wordsmiths had a field day writing about the changes. “You’re ahead in a ’67 Ford!” The clarion sounded loud and clear that Ford was the undisputed luxury leader in the volume car field. “Quieter because they are stronger” and “stronger because they are built better” was the word from marketing and advertising got the message out to consumers. 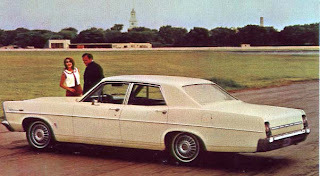 The crown jewel in the full-sized Ford family was the LTD line, now a separate series of its own. LTDs were powered by the potent 289-cid Challenger V-8 mill. New this year was the SelectShift Cruise-O-Matic transmission. LTD promised to “radiate the quiet elegance of a custom limousine” for its owner. A trio of the very posh models was fielded: two- and four-door hardtops along with a four-door sedan. Interiors were ritzy, appointed with simulated woodgrain and LTD crests on the doors. Twin-Comfort Lounge Seats were of the split-bench type, topped with a generous centre armrest. Last year’s XL option package was upgraded significantly by the folks in Oakville and repacked into a pair of full-fledged and very sporty XL cars for the domestic market. The hardtop and convertible came complete with their own distinctive badges and Thunderbird bucket seats upholstered in rich, smooth leather-like vinyl. 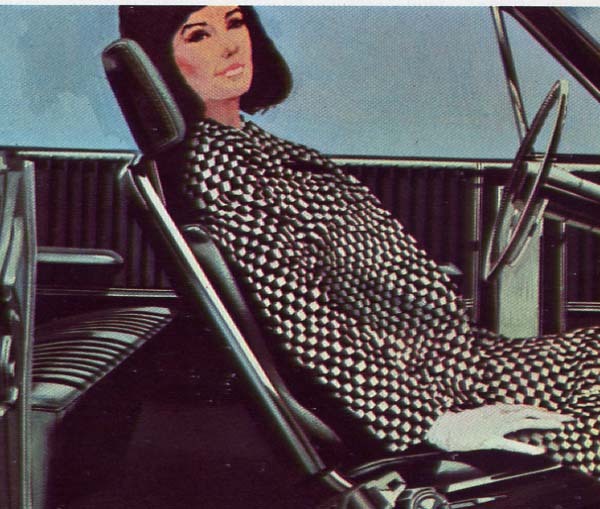 The fancy, fast Fords boasted a centre Command Console, complete with a snazzy T-Bar Shift lever for the SelectShift Cruise-O-Matic transmission. If the base XL wasn’t ferocious enough, it could be beefed up even more with an extra-cost 428-cid V-8, power front disc brakes and a special suspension layout. Optional seating was offered: reclining buckets with adjustable wrap-around headrests. 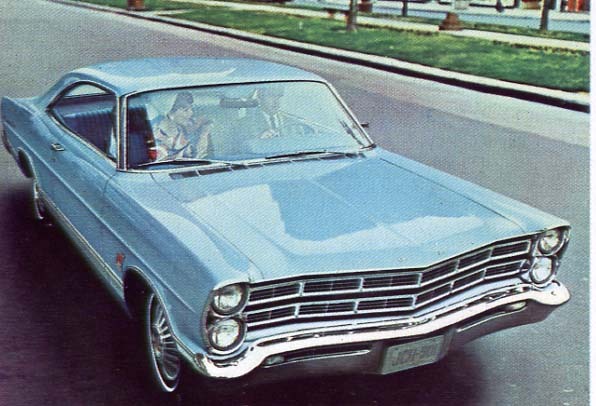 It is interesting to note that the same two models were marketed in the United States--not as models in their own right but as an upscale sub-series of the Galaxie 500 line. 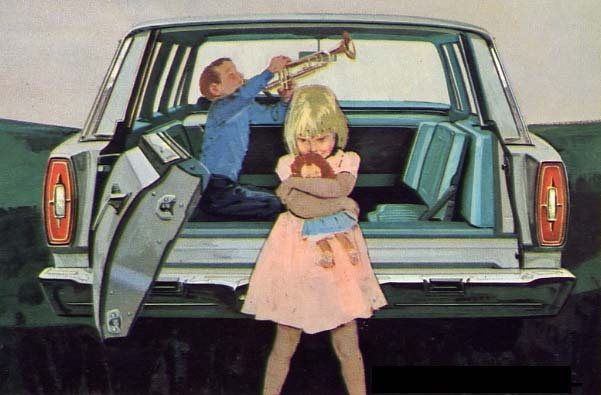 Oakville was fully aware that the Galaxie 500 series was its bread and butter. Consumers might drool over all of the fancy Fords on the showroom floor but it was the value-loaded, lower-priced lines they would sign for when it was time to make a deal. Advertising touted its Galaxie 500 line as Ford’s most versatile series and offered it as a sporty two-door and four-door hardtop, a four-door sedan and a convertible. The Custom 500 and the Custom brought up the back of the Ford pack. The basic full-sized strippers tore down the Number One Highway courtesy of Ford’s Big Six, mated to a fully synchronized standard transmission. Modest they might be but they came with full carpeting throughout, interior courtesy lights and foam-padded seating. To round out the stable, Ford included an ultra-swank Country Squire Wagon lavishly trimmed in faux wood panelling and a hardworking, no-nonsense Country Sedan. Each could be had with the cleverly designed, extra-cost, dual-facing rear seats. One could pile up enough options to rival the Bay of Fundy at high tide during a full moon. Some of the most popular add-ons favoured by consumers were the Tilt-Away Steering Wheel, Power Front Disc Brakes, the SelectShift Cruise-O-Matic transmission, the SelectAire Conditioner, a multi-speaker Stereo-Sonic Tape System, an array of idiot light grouped in a smartly styled in-dash Convenience Control Panel, a wide variety of Tailored Tires and Fingertip Speed Control. That list of safety features was almost as long as the St. Lawrence River and included a dual-brake system, similar to that pioneered by Hudson. Door latches were substantially redesigned and strengthened to prevent accidental opening during a crash. An energy-absorbing steering wheel with a padded hub was installed. Padding was generous throughout the cabin and safety glass was laminated. Fords were given four-way flashers for emergency situations. Standard equipment also included seat belts, a non-glare day-night rearview mirror, break-away arms for the outside mirrors, windshield washers, two-speed or variable-speed wipers, backup lights and self-adjusting brakes. The complete Ford family consisted of thirteen full-sized cars, five Fairlanes in the intermediate lineup, a flock of compact Falcons, a trio of Mustang pony cars and three personal luxury Thunderbirds. And that wasn’t all, either. This season, Oakville offered a dozen (!) station wagons; enough to supply a good-sized group of pioneers with different kinds of transportation to make up an all-Ford wagon train. A pair of full-sized wagons, in six- or ten-passenger configurations, three Fairlanes, two Falcon car-based wagons and three truck-based Falcon Club Wagons all gleamed on showroom floors. Trailer hitch packages were available for them all. It would not turn out to be a banner year for Ford. An extended strike at Ford in the US at the beginning of the new car season had its effects here at home. Ford wisely diverted shipments of parts from suppliers from its other factories and sent them directly to Oakville but eventually the labour dispute forced the Canadian operation to shut down. For the calendar year, workers in Oakville built 63,724 full-sized Fords. Some models were shipped to the States and others were imported. Domestically, consumers purchased 66,448 of the big blue ovals, giving Ford second place in sales behind Chevrolet.